Personalized with your own images and text, our lovely custom Christmas stockings will look absolutely perfect hanging in your home. Design your own personalized Christmas stocking and get yours in time for Christmas with fast delivery. The Bags of Love Christmas stocking is a classic addition to your holidays! You are able to personalize the top with your name, and add your favorite holiday pictures or text to the rest. When adding images to your Christmas stocking, you can opt for a photo collage or single image, with or without text. Pictures of friends, family, and previous Christmas celebrations work perfectly to create a unique and customized design. Simply add your images to our online design system, and we will do the rest of the work! Every item is made in-house, being printed, sewn, and dispatched from our facility. For pet lovers, why not design a custom stocking for your furry friends? Or if newly married, treat your partner to a cute and heart-warming stocking with images of your wedding or favorite moments. Greetings, I highly want to thanks bags of love for the work they provided for me in all 5 items I have bought. Shipping was very rapid and quality of work match what’s online. Your work was so good, when I posted it others ask where I get my Christmas stockings done at. I told them across the pond (London). And they ask why so far I showed them quality and price and they seen why. I will be ordering a luggage and photo album book soon. So yes i love the personalized everything that I can have done. I will visit London feb hopefully I can stop by and visit. What will my Photo Gift Actually Look Like? Because the faux suede has a matte finish, the colors are very bright and bold so you’ll be impressed with how vibrant they turn out. The polar fleece is also a bright white, and it won’t crease so you can store it away year after year and never be disappointed. In keeping with traditional color schemes of the festive holiday when you add text to your personalized Christmas stockings for children, it is printed in a charming red even Rudolph would approve of. Not to forget one of the most important bits, the red ribbon loop to hang it from the fireplace with! Made from a silky ribbon tied in a loop you can display your custom Christmas stockings for all to see. Who Would Like Their Christmas Stocking Personalized? Who wouldn’t!? Celebrate your new bundle of joy with a beautiful personalized baby's first Christmas stocking that you can keep as a cherished memento. No doubt they will laugh about it in years to come! Children love the idea of rushing to open their presents first thing in the morning, so add to your family traditions with a personalized children's stocking – although their excitement might have them up even sooner to discover what’s inside! This product is a clever way of bringing the family together, so present all of your relatives with their own funny or sentimental version on the big day, or show your husband or wife how much you love them with a romantic message. There won’t be a dry eye in the house! Like many of our products, the custom stocking comes with a quantity discount so buy more than 1 today and save money this Christmas. Your design is printed onto suede vision fabric by our expert technicians using a digital printing process which infuses the eco-friendly inks deep into the fibers of the material. This creates a long-lasting print which won't rub off over time. Our craftsmen then hand cut your printed fabric into the traditional Christmas stocking shape which our seamstresses will then stitch together, ensuring enough room is left in the foot for your Christmas surprises. Polar fleece in white tops the stocking, giving it a snow-covered look (this area can be customized with text if you like) and your personalized Christmas stocking is then finished with a red ribbon so that you can hang it. 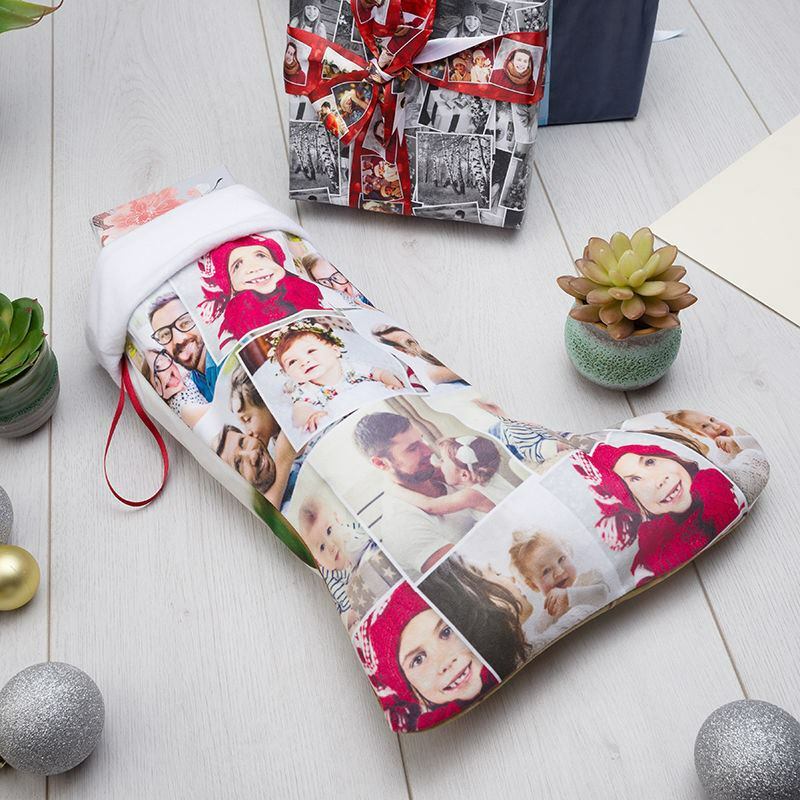 These personalized Christmas stockings for children are shaped like a sock, so try to place the main subject of your photo in the largest area to avoid disappointment. You get to choose images for the front and back, as well as choose a message to be printed onto the white polar fleece. Although there’s no character limit, we suggest a name or short sentence so it looks tidy and can be easily read by all. These luxury stocking can be personalized with anything you like. Use your favorite photos, personalize with names or even stylishly add each person's initials to the stocking for a more modest take on customization. If you’re buying for children, personalized present sacks featuring their name and photo make for a special and fun way to give them something they don’t have to share with brothers or sisters. Plus, it saves any confusion or disagreements on the big day about which one is for which child! Children are what Christmas is all about, so make them the star of the show. Opt for a collage, picking all the best photos from previous years as a nice way to reminisce about the season and all your happy memories. Pets are part of the family too, so put some treats inside their very own Christmas stocking personalized with their cute face so nobody is left out of the party that is the present opening!